Silas Marner, a respected resident of lantern Yard, is wrongfully accused of theft. Silas isolates himself from all companionship, focusing on his work instead. The reader is introduced to Squire Cass' two sons, Dunstan and Godfrey. Godfrey fears that his secret will be discovered by his father. After an accident at the hunt, Dunstan pays a visit to Silas' cottage. Silas finds things are amiss after returning to the cottage and sets off to the village for help. Some of the villagers gather at the Rainbow, where the landlord is resolving a dispute. Silas appearance at the Rainbow surprises the farrier. Silas tells his story to the group. With all the evidence of the crime destroyed, the villagers continue to search for a suspect. Godfrey discovers what has happened to his horse. The Squire confronts Godfrey, inquiring about the money he is owed and Dunstan's whereabouts. The robbery continues to bring kindness and sympathy to Silas' door. Godrey looks forward to seeing Nancy once again, but still worries that Dunstan will return to Raveloe. The reader is introduced some additional members of the Lammeter family. Godfrey makes a request of Nancy at the Christmas dance. Molly and her child head for Raveloe, with the intention of revealing Godrey's secret. Silas awakens to find an uninvited guest in his home. Silas inquires about the identity of the child at the Christmas dance. Silas makes a decision concerning the child, viewing her as a gift rather than a burden. Molly is laid to rest. Silas' decision is cause for further sympathy from the villagers. Dolly Winthrop lends a hand. Eppie continues to bring great joy to Silas. Godfrey continues his courtship of Nancy. Eppie, now eighteen, and Silas discuss many plans for the future. After a discussion with Priscilla, Nancy fears she is cause of Godfrey's disappointment. A discovery is made at the stone pits. Godfrey divulges his secret to Nancy. Godfrey and Nancy arrive at Silas' cottage attempting to make amends for the past. Godfrey, although disappointed by her decision, resolves to help Eppie in any way he can. Silas pays a visit to Lantern Yard, and is surprised by what he sees. With all the villagers in attendance except one, Eppie marries Aaron. Eliot, George. Silas Marner. Lit2Go Edition. 1861. Web. 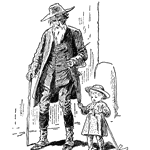 <https://etc.usf.edu/lit2go/196/silas-marner/>. April 21, 2019. George Eliot, Silas Marner, Li2Go edition, (1861), accessed April 21, 2019, https://etc.usf.edu/lit2go/196/silas-marner/.